In two demonstration design trials, six different fungicide treatments were evaluated against an untreated check, to screen for efficacy against Phytophthora Root and Crown Rot (Phytophthora capsici) infecting peppers in two separate fields. One treatment regime was started soon after transplanting of the crop, while the second study commenced once early symptoms of disease development were observed. 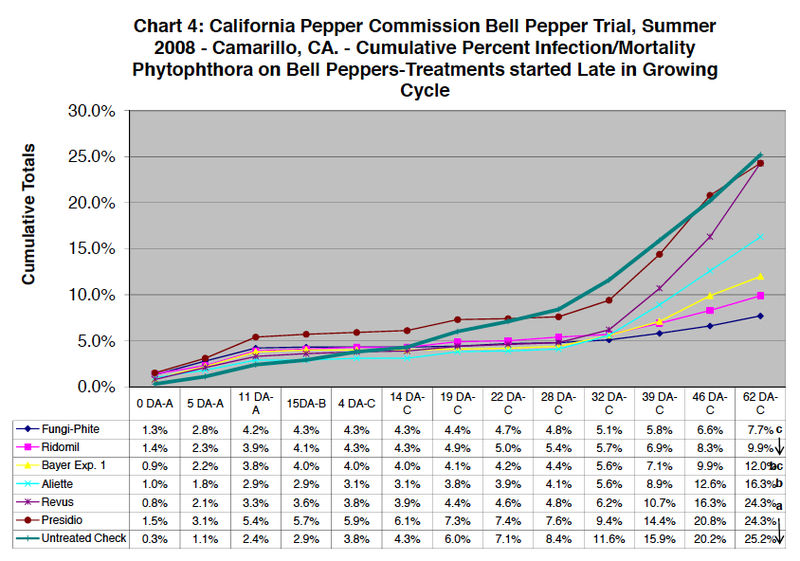 Conditions in the field did favor the development of this disease during the 2008 season in the Ventura growing area. In the trial that was started soon after transplanting significant control of this disease was seen on average from five of the six tested products, with three products giving superior control of the disease over one other products and untreated check. In the trial started after disease development was observed significant control of this disease was seen on average from four of the six tested products, with two products giving superior control of the disease over the other products and untreated check. All data rated as significant was done so utilizing the New Duncan's Multiple Test Range at a 95% confidence level. Planting Date: Early May and June 2008 transplant. 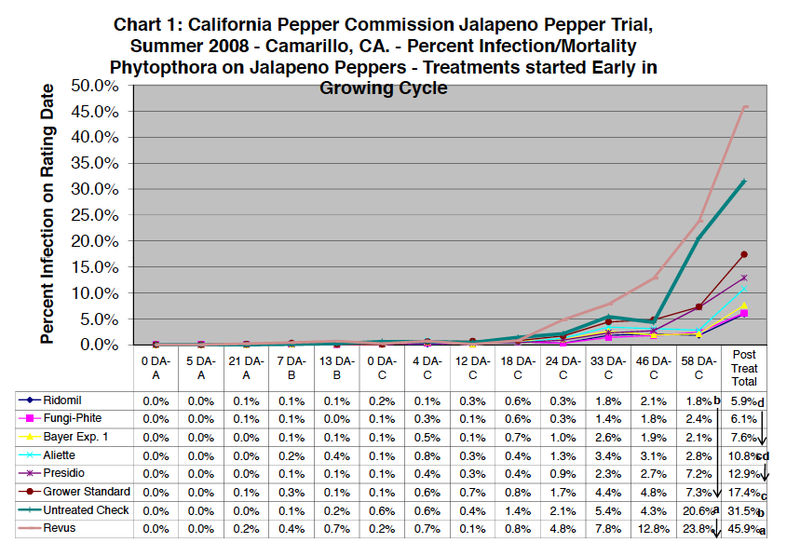 The early treatment program was conducted on a Jalapeno variety of peppers, while the late treatment program was conducted on a processing Bell pepper field. Data Collection: Incidence of disease. Background Information: Both trials were completed in close proximity to one another (within five miles) and the location of the trials was based on past history of Phytophthora infections. Both fields were planted as two line on 40 inch beds with the drip tape running down between the two lines on each bed. 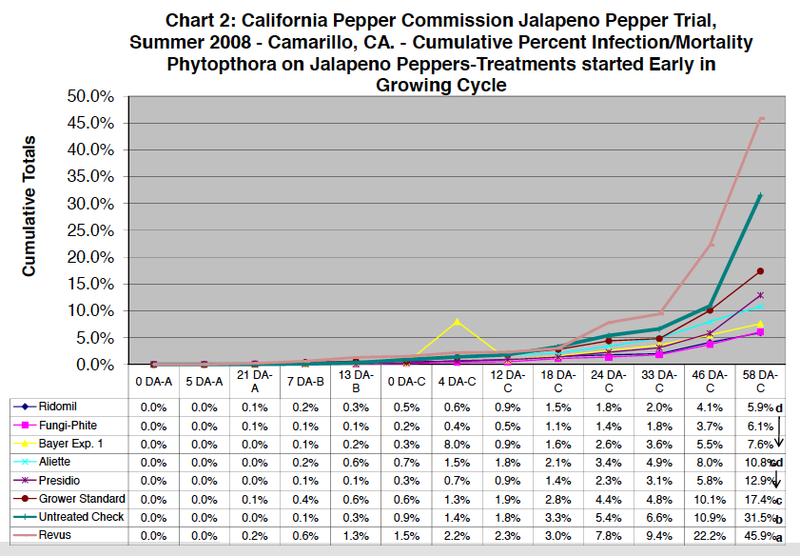 The early start program on the Jalapenos was conducted with a true untreated check with the help of the grower setting up a separate irrigation manifold system to segregate out the test area from his normal post plant Phytophthora control program. This also allowed for the application of the test materials through the existing drip irrigation system. Since this area had a grower standard treatment program the data for those plants is also included in this report. The grower standards included the use of Phosphite fungicides and Actinovate AG biological fungicide. The late start program was in a field without a separate irrigation manifold system, so all treatments did go on in addition to the grower's normal Phytophthora management program. Since the late start trial was conducted on a field without a separate irrigation system all test materials were put down under the drip tape in a banded spray prior to the next irrigation. The grower standards in this field also included Actinovate AG and Phosphite fungicides. This trial was laid out as a Random Complete Block Design (RCBD) of six treatments and a water check control. Each treatment consisted of four replicates each measuring 3.33 feet (one bed) by 200 feet in length. Data was collected from the full treatment area. Treatments were applied in the morning. The test area that had the applications started prior to disease development had all applications applied through the above ground drip irrigation tape, while the second test area that involved applications after disease development was observed had the materials applied on the drip tape, which was then irrigated in with the tape within 24 hours. The following table shows the treatments and dates for each treatment called for in the original protocol. No deviations occurred from the above treatment schedule. All applications were applied as either a chemigation application through the drip tape or as a directed soil treatment using a Solo Backpack Airblast Sprayer with a single line Gearmore Nozzle, just prior to a regular irrigation. The test area was managed for nutrients and pests in the same manner as the surrounding fields with the exception that no soil fungicides were applied to the test area, except for the test materials. The test area was monitored for pest development on a regular basis once treatments had begun. Evaluations for Phytophthora were made by observing the plants in each replicate that were seen to be newly infected or dying from the disease. Incidence percentage was based on the total number of dying or dead plants found with Phytophthora divided by the total number of plants in the replicate. Charts 1 and 2 coincide with the data collected on the trial that began the treatment regime early in the crop cycle (first treatment was two weeks post transplant). Chart 1 show the average incidence of Phytophthora found per rating date by treatment, sorted from lowest overall average rating to the highest average incidence found. As can be seen in this chart, based on the average post treat incidence ratings (the last column), three treatments with Ridomil, Fungi-Phite (a phosphite based fungicide), and the Bayer Experimental 1 fungicide gave the most significant control of this disease. In addition Aliette (another phosphite type fungicide), Presidio, and the grower standard provided significant control of this disease over the untreated check. Revus seemed to not provide any control in this trial over the untreated check. Chart 2 shows cumulative incidence by rating date of Phytophthora as the season progressed. Charts 3 and 4 coincide with the data collected on the trial that began the treatment regime late in the crop cycle (first treatment was at least six weeks post transplant). Chart 1 show the average incidence of Phytophthora found per rating date by treatment, sorted from lowest overall average rating to the highest average incidence found. Data in this chart is similar to that which was seen in the early treatment trial with the exception that the separation of the means is not as significant in this trial as was in the early treatment regime with someone higher post treatment incidence being found on average for the treatments that were providing some control. In the case of this trial both Fungi-Phite and Ridomil provided superior control of this pest over the untreated check, Revus, and Presidio. Both Bayer Experimental 1 and Aliette provided significant control over the untreated check, Revus, and Presidio. Again, Chart 4 shows cumulative incidence by rating date of Phytophthora as the season progressed. It should be noted that part of the purpose of this trial was to help establish baseline control based solely on single chemistry use. In real world situations labels generally do not recommend or allow for this utilization regime for these materials. Presidio is one such product and the label specifically calls for a rotation use with non-similar products and tank mixes with non-similar products. 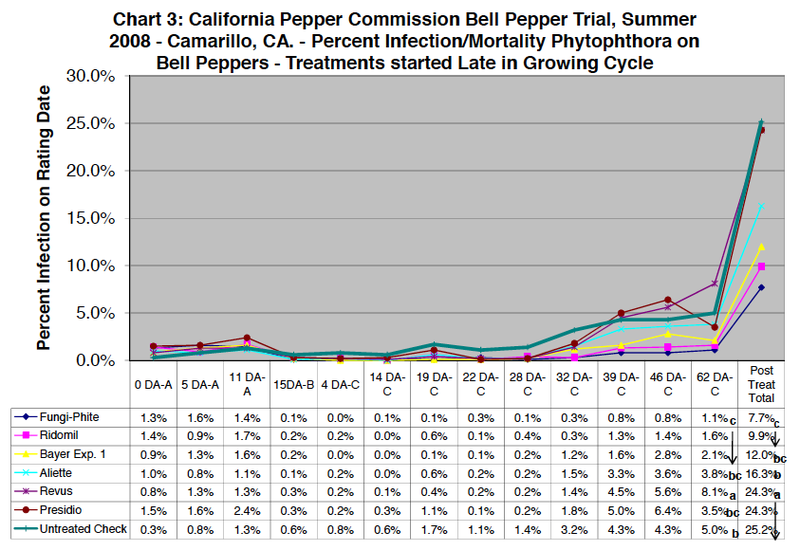 With permission from the Manufacturer's Technical Representative, I can say that in a trial conducted by this researcher this past season utilizing Presidio as outlined under label recommendations, Presidio did perform in like manner to the best treatments seen in these Pepper Commission trials. Similar requirements for the use of Revus also exist, with the exception that the Revus label does not claim control of Phytophthora, only suppression. All data rated as significant was done so utilizing the New Duncan's Multiple Test Range at a 95% confidence level. With heavy disease pressure development seen during the 2008 season in these test plots, the effectiveness of the tested products was well defined. Though differences in disease incidence between the early treatment and late treatment regimes was not significant, the data would tend to confirm that starting treatments early for this disease in fields known to be infected does provided better season long control of this disease. It would appear that growers have numerous effective products either available or in the development stage for control of this disease for conventionally grown peppers. Due to certain label restrictions (number of applications, pre-harvest intervals, etc.) future studies would help to establish rotational product use regimes to provide information on how to use these chemistries effectively for the control of Phytophthora Root and Crown Rot.